It’s been almost two years since I’ve updated this site. I’ve been see-sawing about keeping it up again, mainly because of time commitment. In the past 2 years, I’ve learned how to unplug and take more naps, and I’m just not sure if I want to go back to having multiple personal projects again because taking time for myself and doing almost nothing have been glorious. I’m active on Instagram as @ext212 but lately, I’ve been wanting to write again, even if it’s just finessing a recipe I’ve tested. So let’s just say that maybeee I can ease my way back to writing here again but without being tied to a regular schedule? 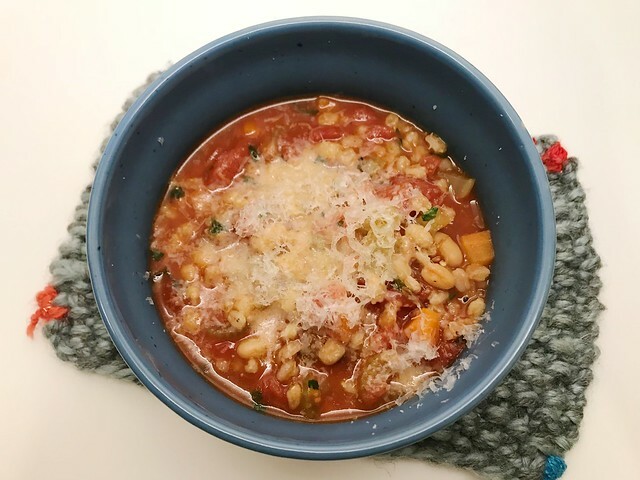 To start again, I wanted to test this recipe from Mark Bittman when the weather got cold again this season. I thought it would be a comforting bowl even if there isn’t any meat involved and I was right. I went for the shortcuts though, using canned beans in water instead of dried, and using a can of chopped tomatoes rather than fresh ones to save time. I gather that this version is not as hearty as originally intended, but a couple of bowls for dinner made me pretty warm inside. 1. Put oil in a large Dutch oven over medium heat. Sauté garlic until golden. Add the onions until translucent. Add the celery and carrots with some salt and pepper and cook until onions have softened. 2. Add farro, the beans, the tomatoes, and the stock. Mix well. 3. Bring to a boil, then adjust heat to a steady simmer. Cook until farro is tender, at least 15 minutes, adding stock as necessary if mixture becomes too thick. Stir in parsley, mix, then cook another 5 minutes. Taste and adjust seasoning, then serve with lots of Parmesan.